Do you wish people would throw the ball for you? Are you tired of Fido getting all the petting time? Do you want to play with squeaky toys? 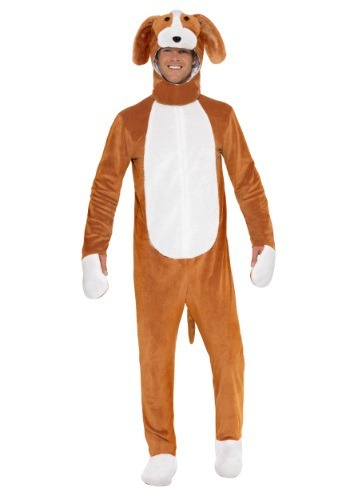 Then this costume is most definitely for you! This adult Cocker Spaniel costume gives you the chance to replace Rover as the most lovable, pettable cutie in the house. He might get jealous when everyone wants to take you for a walk instead of him, but it's been a long time coming. You deserve some attention too. After all, you're a good boy! This detailed costume will turn you into the family pet, even if you're already got a four legged friend at home! Zip up jumpsuit wears with ease, and soft velour and faux fur will have you feeling very "poochie." Just secure the attached mitts around your hands, slip on the shoe covers, and wear the oversized hood, and you'll be transformed into what we'd have to think is the tallest canine around. (At the very least, the only one to walk around on two legs!) With the plush details on this hood, we wouldn't be surprised if your friends or family starts asking you to "shake" and "roll over." Well, let's just make sure they pony up some doggie treats before you start performing!